A talk on crocodiles, its feeding and a screening of movies. Potrays a wide array of urban as well as suburban wildlife through the lenses of one of a bright aspiring young mind. We always wish there was someone to tell us of the ground rules of photography! Sundarvan brought to you one chance to interact and learn about wildlife photography. 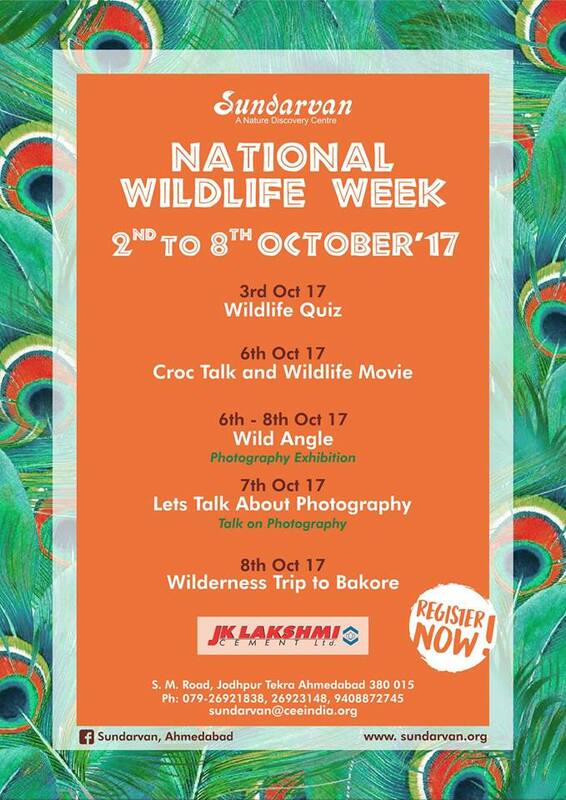 Every year, Sundarvan team plans unique events as a part of National Wildlife Week celebration. This year too, we invite you to have a Wildlife Friendly October with us..
For more details email us at sundarvan@ceeindia.org or call us at 079-26921838, 079-26923148, 9408872745.